The statue of Queen Victoria that resides in front of the Strathcona Music Building was recently doused in green paint in a show of anti-imperialist solidarity (see our editorial, page 3). The administration has largely been critical of this so-called vandalism, and many expected Principal Big Suze to be equally critical. However, she has stayed uncharacteristically silent on the matter. An anonymous source close to Suze tipped the Daily off to the fact that Big Suze’s stance might be more complicated than she lets on. 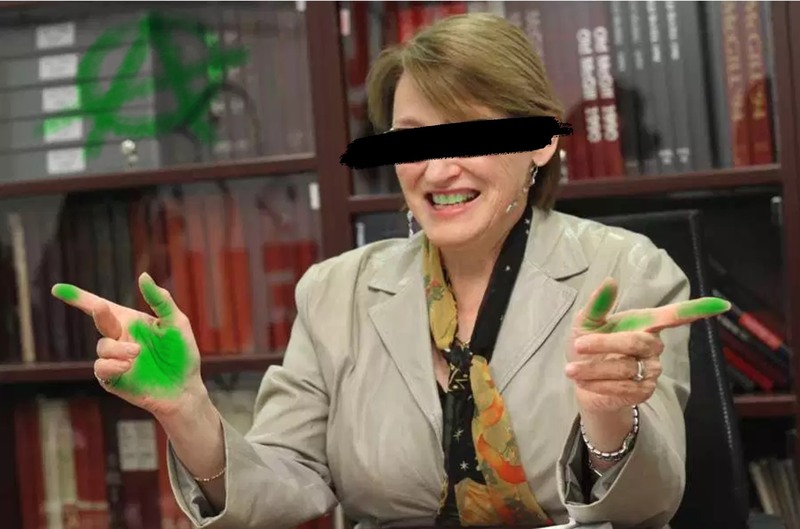 We sent our investigative team to Big Suze’s office and they discovered something shocking: under her desk were multiple cans of green paint. Unfortunately, she reportedly burned off her fingerprints in 2012, so there is no way to prove whether or not she has touched the paint cans. Later, during an unrelated enquête, the Daily’s investigative team found receipts in a dumpster outside James Admin, which showed the purchase of green paint several months ago, as well as yellow paint. We figured that someone was simply redecorating their home, but then we remembered that the statue of James McGill was recently painted yellow. We went to the hardware store that sold the paints and requested to watch the security tapes from the day in question. As you may have guessed by now, Big Suze was the paint-buying culprit. Who’s to say if she painted both the statues? There’s still reasonable doubt that she’s innocent, but there’s also significant evidence against her. We wonder if she’ll strike again, and if so, where and when will she continue her crusade? All we know for sure is that vandalism is very bad, and that statues are apolitical and should be respected.